Here at Synergy we are able to offer treatment for a range of conditions affecting the bladder, bowel or pelvic floor. Whether you leak when you cough, sneeze, do aerobics or just can’t get to the loo in time – we can help. Often women are unaware of how straight forward and effective the solution can be for some embarrassing complaints. Why would I come and see a Women’s Health Physiotherapist? Our St. Johns clinic offers a dedicated facility with discreet treatment options which can be as simple as a tailored exercise programme or may use the most up to date equipment available. Through holistic therapy our aim is to help you back to a full and active life. At Synergy we can treat those painful problems too. Don’t put up with being told “You’re pregnant” or “it’s your age”. 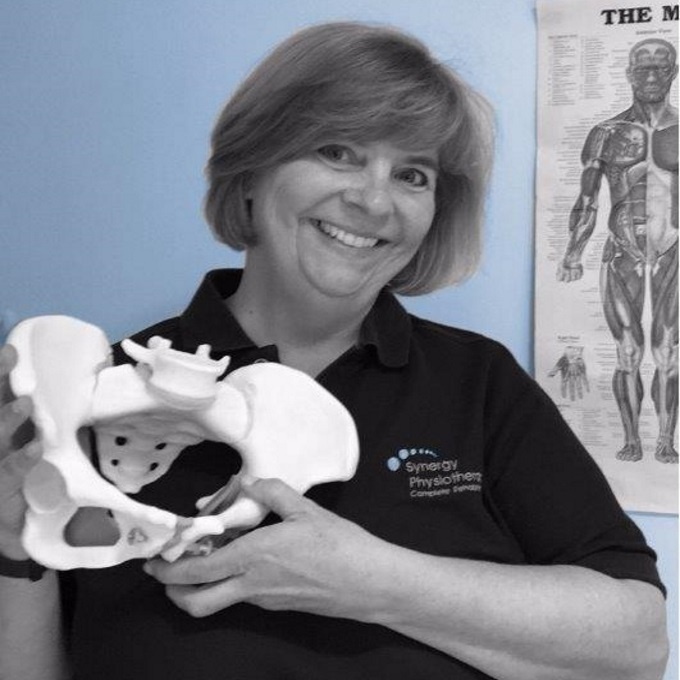 Whether the pain is in your back, pelvic girdle or the pelvic floor itself, by using a combination of manual therapies we can provide relief and resolution. Our Lead Women’s Health therapist, Linda Tranter, has a wealth of experience having worked in this field for over 25 years. So whether you are pregnant, have just given birth, taken up running or are going through the Menopause we can help with problems as they arise. Men can also suffer with continence problems at certain times of their lives and Linda is experienced in helping them overcome these difficulties. • Exercises – many women only need an intensive progressive programme of pelvic floor muscle training to see a noticeable improvement with their symptoms. Learning to contract these muscles correctly with the lower abdominal muscles is really important. • Bladder training – there are specific techniques that can be taught to train the bladder to hold more urine and therefore need emptying less often. This helps problems of urgency and frequency. • Biofeedback – equipment can be used to teach us how to use the pelvic floor muscle correctly and effectively. It can also be used to assess if there is any improvement in the strength and endurance of the muscle. • Muscle stimulation – in cases where the pelvic floor muscle is very weak and unable to contract independently equipment can be used to remind the muscle how to work. The equipment stimulates the pelvic floor muscle and as the muscle remembers how to contract exercises are then added into the treatment programme. • Relaxation techniques – anxiety and tension make bladder problems worse. Specific relaxation and breathing techniques can help to gain control over your bladder or improve sexual function. • General advice – about fluid intake, bowel control, exercise levels and setting achievable goals. Sandy is our Women’s Health Physiotherapist, a clinical specialist with over 15 years experience working in the field of Women’s Health, treating a wide range of conditions.